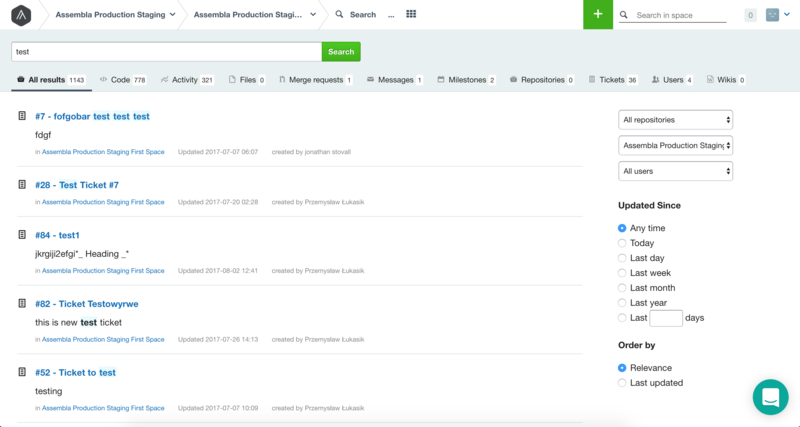 We at Assembla know that the search function can often be one of the most useful features for our users. That’s why we continually seek to streamline the experience and add functionality. Currently, users can execute searches at the Portfolio, Space, and Repo levels. The results can then be refined by repo, space, or user. Results can be filtered by type, including Code, Activity, Files, Merge requests, Messages, Milestones, Repositories, Tickets, Users, and Wikis. Additionally, search results can be filtered by the time they were last updated and can be ordered either by Relevance or Last updated. Search results will display the Space they are located in as well as the date and time they were last updated. Our predictive search feature allows for users to view the first few search results without opening a new search results page. The results are displayed sorted according to result type.